Persona 3 only briefly mentions suicide itself, however. One of the game's characters, Fuuka Yamagishi, is a victim of bullying prior to joining your party. When her tormentors lock her in the gym and she disappears soon after, one of her captors suspects that she might have committed suicide. Later, however, you discover that she has the potential to summon a Persona to fight the Shadows; when she is given an Evoker, she instinctively knows how to use it. The Evokers suggest mental defense rather than any kind of death wish. That's not to say that suicide isn't a central theme to P3, however; it's just rarely mentioned outright. Nyx, the final boss, gains his power from a form of suicide - not an individual's desire for death, but rather society's apparent paths of self-destruction: crime, poverty, pollution and war. The aforementioned methods of "societal suicide" can have a very taxing effect on individuals as well, an effect which I have personally experienced. However, each of the characters in P3 finds their own way to overcome their negative feelings to fight Nyx and the Shadows. The theme of overcoming cynicism may seem clichÃ© to followers of JRPGs, but it's no less important to explore and understand. And in order to get that message across, Persona 3 needed something shocking. Hence the gun to the head. It certainly got your attention there, didn't it? It is in this aspect that P3 brilliantly succeeds where most other JRPGs fail. 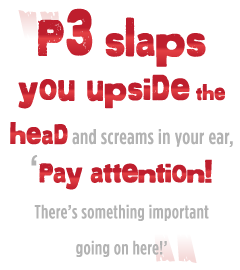 Its imagery commands your attention; where other JRPGs annoyingly preach from their respective soapboxes and expect you to listen, P3 slaps you upside the head and screams in your ear, "Pay attention! There's something important going on here!" Many JRPGs attempt a discourse on society, the fate of the world and other clichÃ©s of high school philosophy, but P3 actually says something, and says it in such a way that's both enjoyable and intuitive. This is how P3 earned a following among Western gamers like few other JRPGs have. It offers a message directly relatable to those who have feelings of depression and malaise at the world in general (which everyone experiences at some point in their lives): You're not alone, but don't wallow in your own negativity. Get off your duff and fight those feelings. It took the Evoker to get our attention, but Persona 3 earns its place in an elite category that few JRPGs have achieved: games that actually express something. Phillip Miner is a freelance contributor to The Escapist.